There are three different shapes to consider as you plan your DIY wedding bouquet ideas. Here are the main bouquet shapes that I cerate all the time for brides. Depending on how confident or experienced you are may be a factor in which bouquet you decide to create. Although we are only going to explore three DIY wedding bouquet ideas they each give you a very different look. This is probably one of the easiest bouquet types to create. It is traditionally held over the arm as you can see in the photo here. The main reason this bouquet is easy to make is that it doesn’t require many flowers. 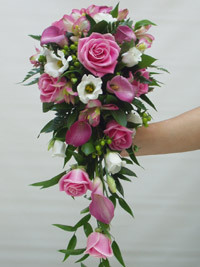 It is really suited to calla lilies, roses (as you see in the photo) and gerberas. You can arrange this bouquet with structured leaves such as aspidistra and fatisa or more trailing foliage such as soft ruscus and ivy. Both types of foliage give you a totally different look. Need some help to get started? Then you might find my ebook on DIY wedding flowers useful as it has a step-by-step guide to creating this bouquet. Another great thing about the handtied sheaf bouquet is that you can make it the night before and place it in a narrow vase with a small amount of water in it to keep it fresh. Posy bouquets are without a doubt the most popular style of bouquet, this is probably because they suit all styles of wedding dress. They can also look totally original by combining different colors and types of flowers unique to your own color theme and style of wedding. Handtied posy bouquets are relatively easy to create, the easiest being a bouquet that just uses a mass of one type of flower. Not sure where to start why not check out my ebook DIY wedding flowers, this book contains a step by step guide on how to create a rose handtied posy. 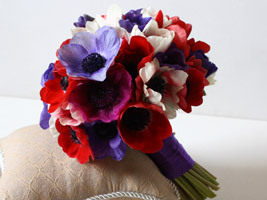 Another wedding bouquet idea is to combine a mixture of different flowers together to create a handtied posy. This is not as easy as using just one type of flower, but it’ not difficult. It all comes down to practice, if you have a couple of goes at it you are sure to get the hang of creating it. Don’t forget when you are practicing you can take the bouquet apart several times and keep having another go. 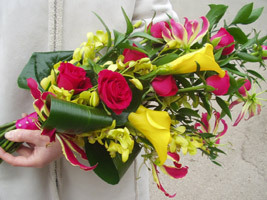 Flower that suit this style of bouquet include roses, freesias, gerberas, ranunculus, tulips and calla lilies. This is probably the most difficult bouquet to create out of the three, it’s not necessarily making it that’s difficult but choosing the correct flowers and foliage is a little more crucial. On this occasion having a mixture of plant material makes the bouquet easier to make. If you are not an experienced flower arranger I would defiantly suggest you create your shower bouquet in an oasis handle. This allows you to glue the flowers into the oasis so they are secure. You can then water it so that it stays fresh even on a hot day. You can lots of different types of flowers to a shower bouquet. You just need to think about combining flowers that trail down such as roses, lilies, orchids etc with shorter flowers like freesias, lisiantus and chrysanthemums. You can find step-by-step instructions and photos on how to create a shower bouquet in my ebook DIY wedding flowers. I hope this guide to the three main wedding bouquet ideas helps you as you embark on creating your own unique DIY bridal bouquet. Good Luck and just don’t forget to practice a few times well before your wedding day.